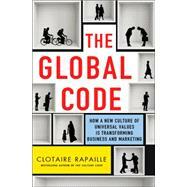 For decades, Clotaire Rapaille's work focused on how people's relationships with the most important concepts in their lives—love, health, and money, for instance—are guided by subconscious cultural messages. But recently, he has uncovered a new phenomenon: a "global unconscious," or core values and feelings that are consistent worldwide—the result of our constant interconnectedness. He has also identified a new group who are paving the way for the future of decision-making: the Global Tribe. These individuals are fluent in the language of culture, untied to any notion of nationalism or ideology. They are defining the key values driving our new world economy, with profound implications for how companies market their products and services. DR. CLOTAIRE RAPAILLE is the founder of Archetype Discoveries Worldwide, a company that has been successfully guiding its clients' interests in marketing, brand positioning, advertising, and product development since 1976. Their global clients include Boeing, Citibank, Fidelity Investments, Ford Motor Company, General Electric, Georgetown University, IBM, Honda, Johnson & Johnson, L’Oreal, and Procter & Gamble, among other Fortune 100 companies. He lives in Palm Beach, FL.